If you had to sum up Mr. Robot season 2 in a single phrase, you wouldn’t be too far off deciding to go with "Identity Crisis." That phrase encapsulates a good amount of the season 2 narrative revolving around Elliot Alderson and his alter ego Mr. Robot but it also makes for a pointed critique of a series that felt a shade off its impossibly good game just a season earlier. Sam Esmail's series about a revolution born from the fractured mind of an alienated hacker did the sort of season 2 swerve that was at once too indulgent to the creator's particular stylistic whims while at the same time it offered a delay that actually made sense in regard to the narrative at hand. No, not the seemingly mandatory episode 7 twist that revealed Elliot had been in prison since the season premiere but rather that the revolution incited by fsociety at the end of season 1 had simply petered out. Revolutions, as it turns out, aren't just a keystroke away. The realization that the propulsive plot of Mr. Robot's first season had become mired in – what else? – bureaucracy, and that fsociety had likely been played for patsies by the Dark Army and E Corp's icy CEO Phillip Price as a means of destroying the world's economy so they could control a new one does help justify the slowed pace and indistinct destination of season 2. That is to say, the identity crisis of Mr. Robot season 2 is so vast it also encompasses the way the series goes about telling its story. At a certain point, you have to hand it to Esmail: he followed through with his protagonist's early season promise not to trust the other "friend" in his head – the one the audience has been led to believe they are – to the degree that there's no way of knowing what was on tap for the finale 'eps2.9_pyth0n-pt2.p7z'. 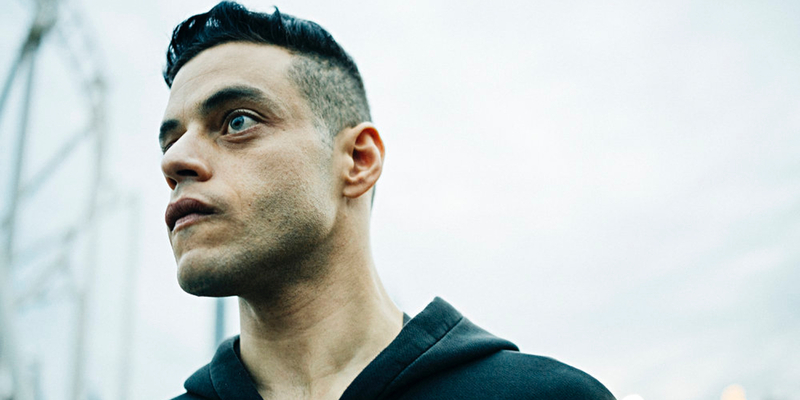 It is a different kind of game Esmail's playing with his story and his characters and its one that, while watching, you wonder whether he'd ever be able to pull it off without the help of Rami Malek and his Emmy-winning performance. It's a tough sell, asking the audience to watch a character, to spend so much time with a direct line to his thoughts and his experiences and to essentially walk away week after week questioning the validity and importance of everything you just saw. But the season has adjusted to such questions and the sense that the show itself is alienating those watching by upping its game with Angela and Darlene – both Portia Doubleday and Carly Chaikin essentially started their own shows within a show in season 2 – making their somewhat removed stories still distinctly a part of the ongoing fallout from the Five/Nine hack. After last week's unsurprisingly questionable appearance by Tyrell Wellick and the still lingering possibility that Darlene and Cisco are dead (though good money is on the latter while the former is going to make it), there's plenty for the finale to dig into. And dig it does. The hour spends much of its time sifting through questions that have risen since Elliot was released from prison. This again is an issue since the season's story line couldn't take off until seven weeks in, as the show's main character was sequestered from the rest of story and the audience, making it incredibly difficult for plot to do more than what Elliot's character was doing: sit around pretending he was somewhere else. But once the digression of Elliot's incarceration was brought to a close, Mr. Robot began putting one foot in front of the other and things started moving again. Even then he had to play catch-up with Angela and Darlene, two moons deserving of planetary status given the significance of their plots and how confident both performers were in essentially picking up the slack of Elliot's story. And although Elliot and the larger Mr. Robot narrative managed to sprint for the last three episodes of the season, it doesn't quite feel like they reached anything resembling a finish line. What the season 2 finale tells us is that, as a series, Mr. Robot is structured more like a movie than anyone had previously been aware. Season 1 functioned as an exciting and propulsive introduction that took a sprawling idea of revolution and fractured psyches and one massive hack and delivered upon all the promises it made. It told a complete story with a distinct beginning, middle, and end. It's clear now that was simply the first act. The second season wasn't a contained story within the larger series; it was a direct continuation of first, a second act in a single narrative that has become narrower without necessarily becoming more focused. In this case, though, the more diffuse storytelling may actually be a function of the particular narrative Esmail is setting up, as Elliot's mind has splintered in such a way there's no telling what's real and what's not in any given scene he's in. That's a particularly dangerous game for Esmail to be playing, as it almost requires the audience divest themselves from the protagonist. But at the same time, it continues to have its little thrills. Instead of the always-sure antihero, Elliot is embodiment of alienation, right down to his role in his own story. Esmail delayed the return of Tyrell Wellick for almost an entire season (save for the flashback at the arcade and a dream sequence), and even then he refused to confirm Wellick's existence was real for much of the hour. Esmail was able to wring some solid tension from a last-minute confrontation between the two; one stemming from a revelation of what phase 2 of Mr. Robot's plan is (i.e., destroy the physical copies of everything the Five/Nine hack destroyed digitally) and Elliot's attempted refusal to take part in that destruction cooked up by him (Mr. Robot), Tyrell, the Dark Army and, somehow, Angela. So why did all the information, the reveal that Tyrell is real and in cahoots with Angela, and that Dom knows Elliot is the real leader of fsociety and behind the Five/Nine hack wind up feeling so, well, empty? A lot of it has to do with the way Esmail is setting up the series' overarching narrative and how season 2 acted as a bridge between season 1 and the already announced season 3. Season 2 didn't have its own distinct storyline; it was the connective tissue between the beginning and (maybe) the end. Trimming Elliot's time in prison and the deception that came along with it could have assuaged this issue, but the season also needed to lift the fog regarding Tyrell, Angela, and Dom. Twists and shocking reveals is kind of Mr. Robot's modus operandi, but it can't be the entire essence of the show. It isn't enough that Tyrell is revealed to be alive (and real) by shooting Elliot in the gut (a problem that has already been resolved per Tyrell and Angela's conversation). It also isn't enough that Angela knows and is in control of far more than she's ever let on, or that Dom has had Elliot in her sights for months now. Finding all this to be true is only significant in that now it's a thing, but for it to truly have weight in the narrative itself there needs to be some actual information behind it so that the audience can understand why and how the characters got from point A to point B. When you consider how much anticipation was built around the Tyrell reveal it stands to reason that there would also be some greater explanation as to why he was willing to become the most wanted man in the world in order to help carry out Mr. Robot and the Dark Army's plans. The same is true for Dom. She could have the whole thing figured out to the smallest detail but because the audience isn't made aware how she connected the dots, the character just becomes another powerful player who gets to change the rules of the game off screen. Obfuscating certain story details works for Elliot because that's his function in the narrative; the same rules don't necessarily apply to everyone else. But even while season 2 felt too loose at times and in need of some editing and stricter limitations placed on its creator, who was essentially given carte blanche to do with an entire series as he will, the willingness of Esmail to try new things and to reach, to be audacious both in terms of the visuals and the series' storytelling, makes you wan to give Mr. Robot a certain amount of slack. The coda at the end suggests Esmail is planting the seeds of the story's undoing, and even though it seems Trenton and Mobley are likely goners (or now experts on Seinfeld) their little conversation provides some glimpse into the story ahead. Despite what was an underwhelming season overall, there's reason to think that the future will be more focused in season 3. It may then be worth it to revisit season 2 after season 3 has wrapped to see how things line up. That's not necessarily how TV storytelling should work, but, then again, Mr. Robot isn't necessarily like anything else on TV. Mr. Robot will continue with season 3 sometime in 2017 on USA.